The director of the Uffizi Gallery Eike Schmidt announced that, by 2017, a part of the self-portraits collection kept by the Vasari Corridor will be moved to some rooms on the first floor of the Uffizi. The works that will be moved are about 50 and it will take about a year to complete the task. We recall that there are self-portraits of Rembrandt, Raphael, Elizabeth Vigee Le Brun, the Gaddi family, Pistoletto. 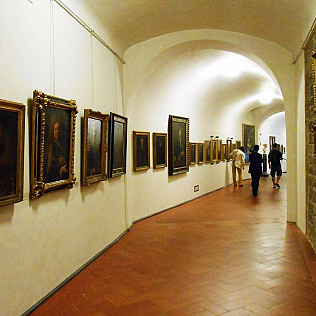 In addition to the 50 that will find a new place in the Uffizi, other works will be exhibited in the same rooms, rolling. The Uffizi director tells that there is the will to make the collection of self-portraits - unique in the world - unique in the world - enjoyable by the public who visit the Gallery, instead of just a small number of people, as it is now. Schmidt also announced that the number of works \"imprestabili e inamovibili\" (that can\'t be lent or moved) has been raised. Now these works are about 30. This is a list of works drawn up together with the Ministry, which also includes the Annunciation by Leonardo da Vinci and the Tondo Doni by Michelangelo. The loans between museums are important, because they create significant and exceptional exhibitions and exchanges, but the director stresses that the Uffizi collection must - as a whole - be enjoyable only at the Uffizi.